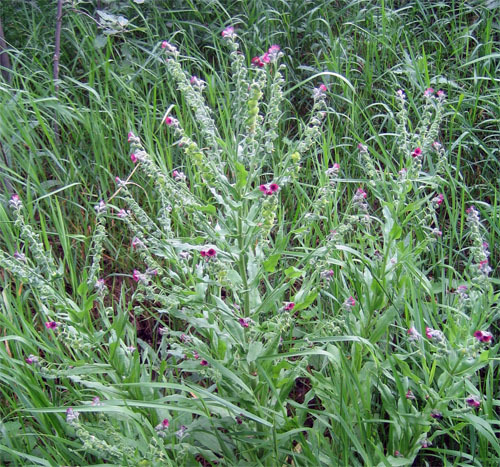 Hound's-Tongue is native to Eurasia and arrived in North America as a contaminant in crop seed. It has been used as a medicinal herb. Fresh or dried parts of this plant contain a toxic alkaloid that causes irreversible liver damage in livestock and people. The hooked seeds attach themselves to animal fur and can cause eye irritation. Hound's-Tongue's petals are united and form a funnel-shaped flower with five lobes. 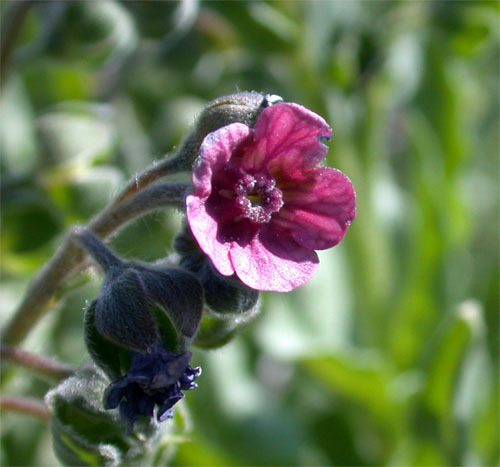 The flowers are deep purple to almost red in color, 5-10 mm wide, and are partially covered by hairy green sepals (small leaves immediately below the petals on the flower head). The leaves are covered with hairs, lance-shaped or elliptic and have smooth edges. All parts of the plant are covered with bristly hairs. The plant’s name comes from the resemblance of the leaf’s shape and roughness to a dog’s tongue - and possibly the smell of the plant. The fruit consist of four distinctive nutlets that are covered in prickles. Hound's-Tongue grows several branches and reaches 40-80 cm in height. Biennial - It forms a mound of leaves and a slender taproot in the first year of growth and then produces a flowering stalk in the second season. 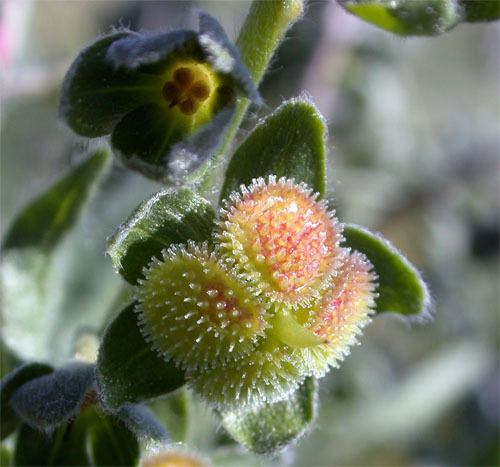 Stickseed - Lappula species – Stickseeds have spines on seeds rather than hooked burs. Tall Lungwort - Mertensia paniculata - native species, but flowers are much more blue and longer than Hound’s Tongue. Garden Lungworts - Pulmonaria species - which are ornamental garden plants and fine for you to grow!